We've been throwing a giant party every year since 2005 and inviting some of our favorite artists to perform. Our favorite listeners have brought their own joy too, of course. 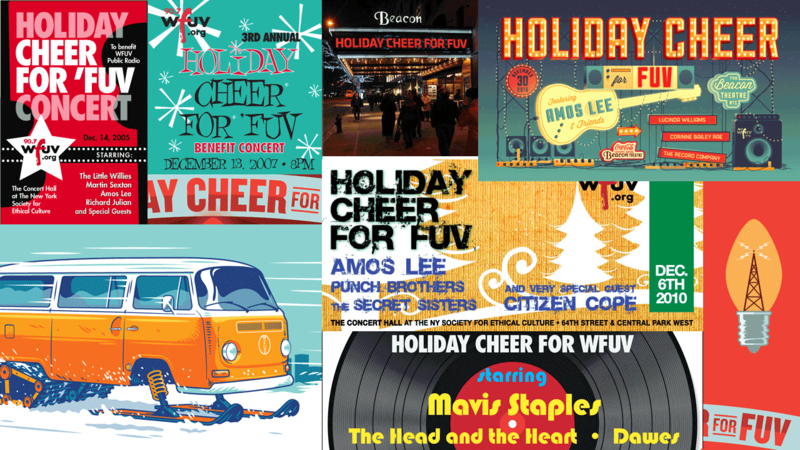 Holiday Cheer for FUV is an important benefit concert for the radio station, so we thank everyone who has ever bought a ticket for the past 13 years. And you still have time to join us for our 2018 edition, on December 3, with a pretty impressive lineup of John Prine, the Lone Bellow, and Shannon Shaw. The first few years we rocked the pews at the Society for Ethical Culture; since then we've called the Beacon Theatre our Holiday Cheer home. We've been recording the shows and tucking them into the FUV Vault since 2012; you can listen to a whole evening of love or one set at a time.